As soon as the weather becomes cold and blustery, I become addicted to soup. I make it at least once a week. It’s one of my favorite cold weather foods. It’s the type of food that warms your soul. I especially enjoy making soup now that I get to cook it in my new Le Creuset pot that my husband gave me for Christmas. 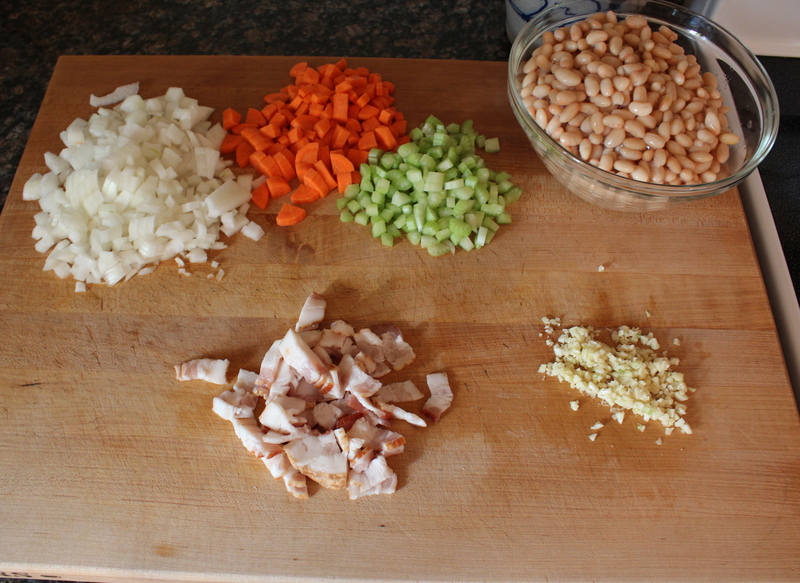 Today, I made a rustic white bean soup that I adapted from The Cozy Apron. This soup is absolutely scrumptious. It’s creamy, thick, and has a hint of bacon in the background. Oh, bacon! Nothing can compare to your fatty goodness. Here’s how to make this delicious soup. Chop up your onions, celery, carrots, garlic, and bacon. 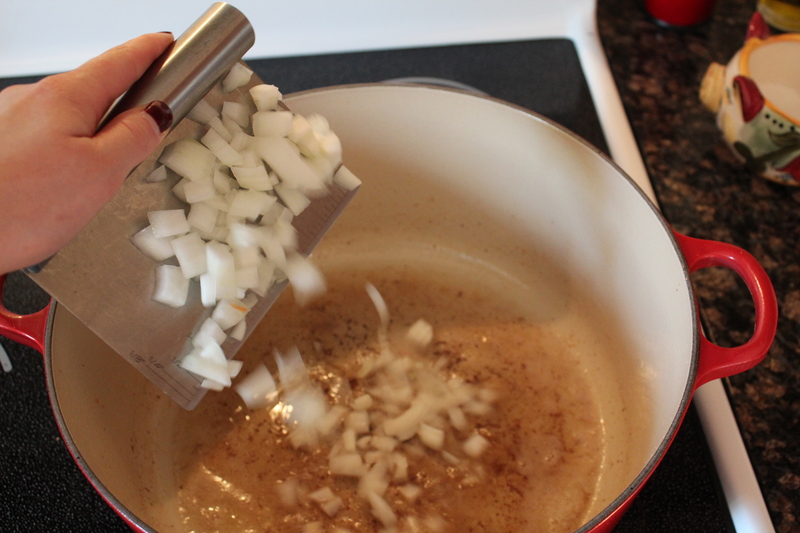 Add about a tablespoon of olive oil to your pot and throw in your chopped bacon. Cook the bacon until crispy. When it’s done, scoop out with a slotted spoon and place on a plate lined with a paper towel. Don’t touch that bacon fat. Leave it right in the bottom of your pot; it’s what makes this soup so dang delicious. 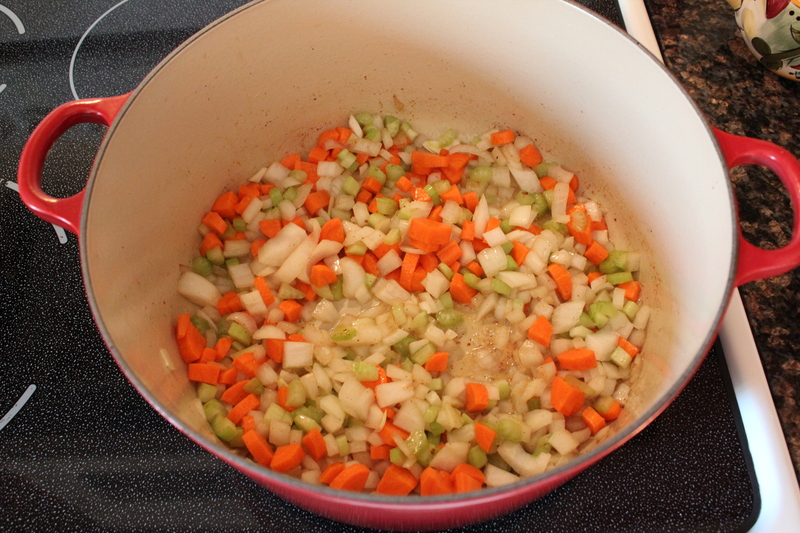 Add a tablespoon of butter to the pot with the bacon fat, then add the chopped onions, carrots, and celery. Cook for 5 minutes. Next, add the chopped garlic, along with a sprinkling of salt and pepper. Cook for another 5 minutes until the vegetable become tender. Smell the bacony goodness. Mmmm! 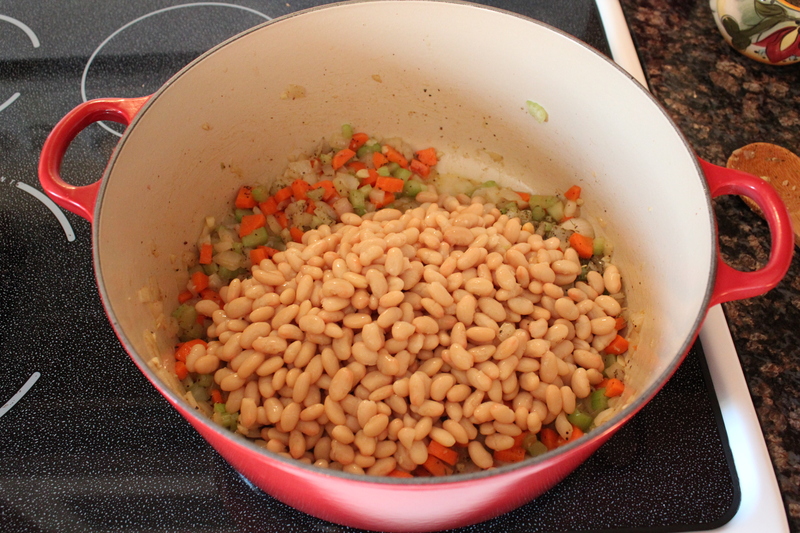 When the vegetables have become tender, add the beans and italian seasoning. Gently stir, trying not to break or mash the beans. Pour in the chicken stock and stir. Cover the soup and let simmer on low for about 45 minutes to an hour until the soup thickens slightly. 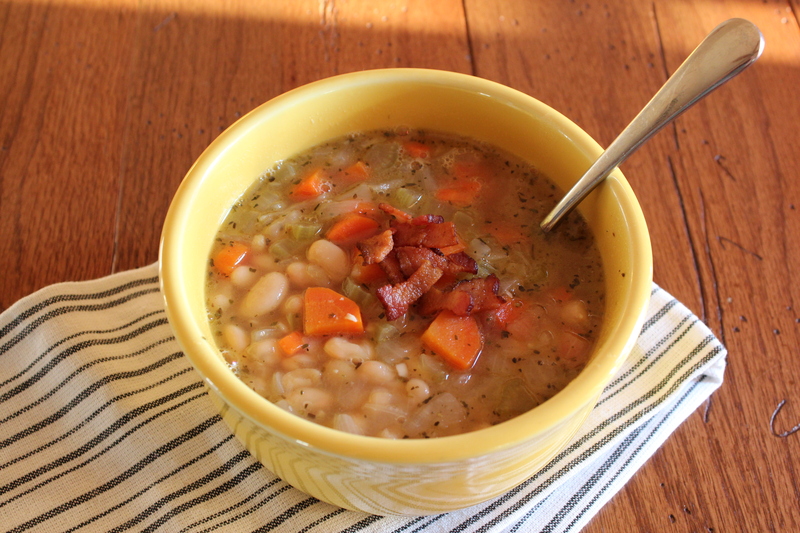 When the soup is done, ladle out a big ol’ bowl and top with the reserved crispy bacon. Enjoy! Heat 1 tablespoon of olive oil in a large stock pot over medium heat. Add the chopped bacon. Cook until the bacon becomes crispy. Remove bacon from pot with a slotted spoon and place on a plate lined with a paper towel. Set aside. 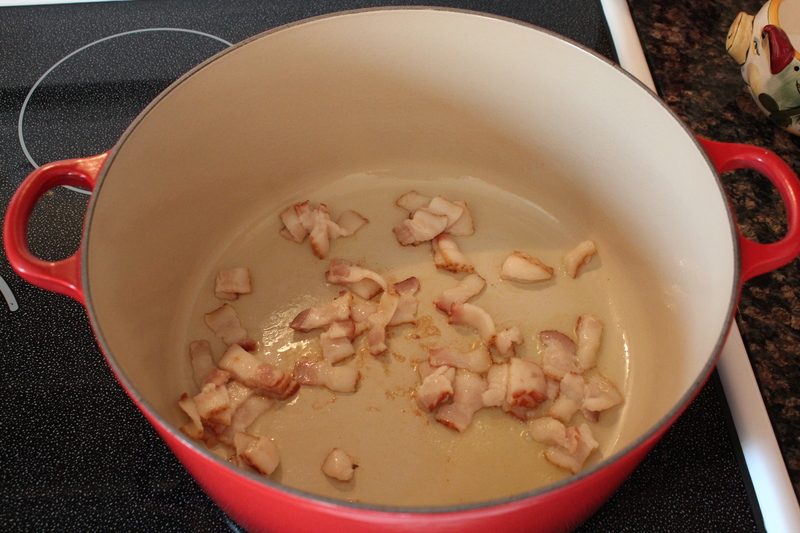 Leave the rendered bacon fat in the bottom of the pan. 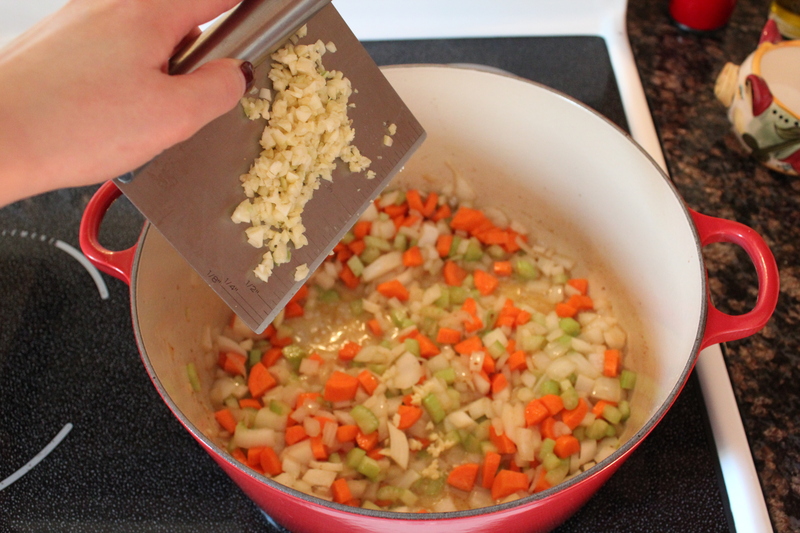 Add a tablespoon of butter to the pan with the bacon fat, then add the chopped onions, celery, and carrots. Cook for 5 minutes. Add the garlic and cook for an additional 5 minutes until the vegetables become tender. Sprinkle with salt and pepper. Add the beans and italian seasoning. Gently stir, making sure not to break up or mash the beans. 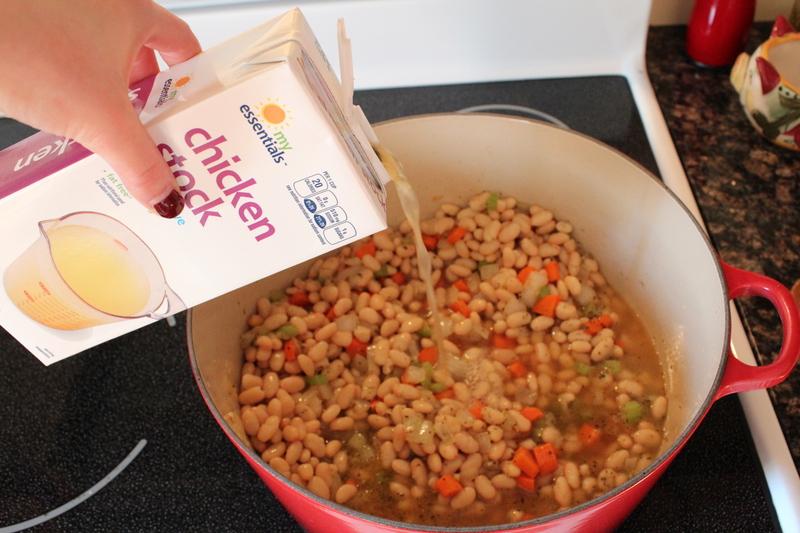 Pour in the chicken stock. Stir and cover for 45 minutes to an hour until the soup thickens slightly. When the soup is finished cooking, add a squeeze of fresh lemon juice and salt and pepper to taste. Ladle soup into a bowl and top with the reserved bacon. This looks scrumptious. I will be trying this tomorrow .